This all around ranch saddle has a modified association front, and features a distinctive post horn with a duck-bill cap and rawhide trim. The rough out hard seat, jockeys, fenders and skirts are accented with a spider stamped fork, cantle and rear housing. 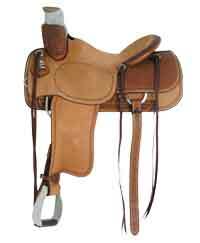 The saddle is a favorite with trainers, trail riders and working cowboys. Available in seat sizes 15 inch, 15.5 inch �and 16 inch.